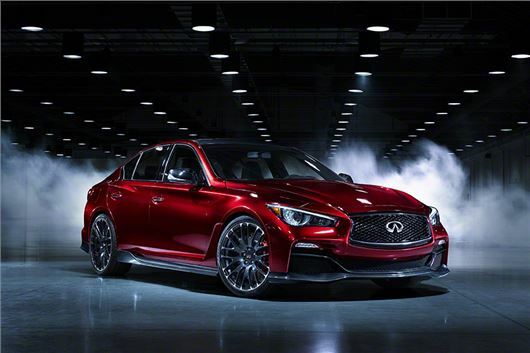 ﻿Infiniti's Q50 may have received less than a lukewarm reception from critics, but that hasn't prevented the firm from unveiling a high performance concept version, called the Q50 Eau Rouge. Along with a lower ride height and wider track, the Q50 Eau Rouge also has bespoke carbon fibre bodywork. In fact only the front doors and arch of the roof pillars are the same as the standard Q50. There are large front and rear wings while a larger rear spoiler creates downforce. The grille comes in dark chrome with a matte finish while the bonnet has double air vents. The concept is fitted with 21-inch alloys. Inside, the Eau Rouge has a high-grip sports steering wheel with paddle shifters along with red detailed carbon fibre detailing on the doors and centre console. Dark-chrome replaces silver-chrome in the red cockpit.